Katie Cleary has been surrounded by beautiful people her entire life. The actress and model was voted one of People's 100 most beautiful people in recent years. What drives this Hollywood starlet to save some of Earth's most imperiled species? "Some of the most beautiful places in the world are under threat and in imminent danger of losing some of our planet's most magnificent wildlife species," Cleary has said. Through Katie's nonprofit organization Peace4Animals, she has endeavored to raise money for various wildlife causes around the globe. Although, the Bornean orangutan is not "critically endangered" like its cousin the Sumatran orangutan, it is still considered "endangered" by the International Union for the Conservation of Nature (See the IUCN Red List). There are as many six times the number of Bornean orangutans than there are Sumatran orangutans living in the wild, but the Bornean species is considered to have less genetic diversity, which itself is detrimental to preserving this island population of great apes. The Bornean orangutan is also less social and less arboreal than the Sumatran orangutan, but both species of red ape are just as impressive to observe and study in nature. There are few species as beautiful as orangutans, and few places as beautiful as the mountainous jungles of Borneo. 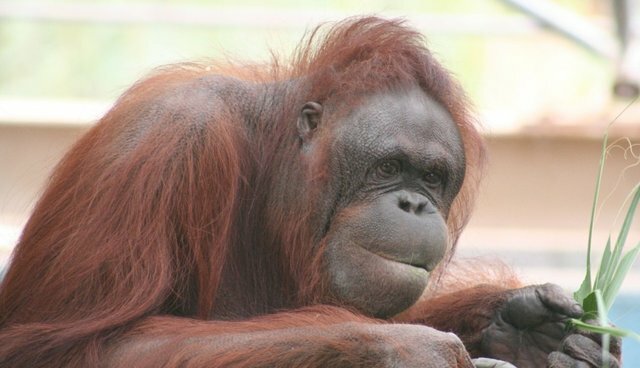 The orangutan is a keystone species, and according to Cleary, losing them would have a significant impact on other threatened and endangered forest dwelling species. Hence, she and Peace4Animals have challenged people to stop palm oil companies from destroying the rainforests in the region. Katie Cleary and Dr. Jordan Schaul Peace4Animals also supports an initiative of the World Land Trust (WLT) to create the Keruak Corridor. The wildlife corridor "will link Borneo's Keruak Forest Reserve with one part of Lower Kinabatangan Wildlife Sanctuary and the effort is a collaboration with WLT's partner NGO in Malaysia, Hutan." I previously reported on Cleary's award-winning documentary Give Me Shelter for National Geographic. Like Jordan's public Facebook page.